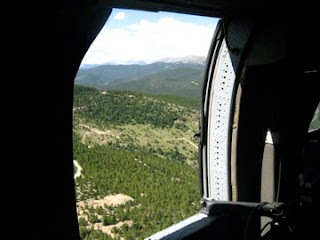 Yesterday, I flew up to (via Blackhawk helicopter) and back from (via Chinook helicopter) the Colorado Army National Guard's High Altitude Aviation Training Site. The undeserved experience was the result of the generosity of one of our staff, who was in the Guard and recently returned from a stint in Iraq. (His story is here.) I'm the director of the organization that treated him well, although the credit really belongs to many others. Nonetheless, I got some cool photos. 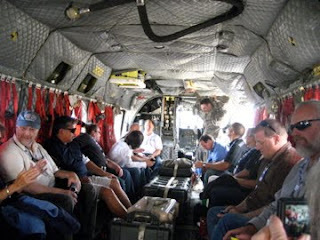 We flew from Buckley Air Force base to the HAATS site in Eagle. 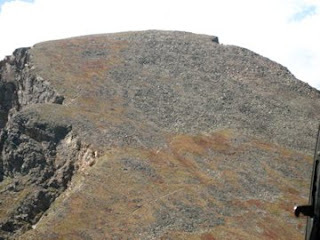 And this is a photo, out that same window, as we just nudged over the very high point of the divide. Our air speed was about 100 mph. 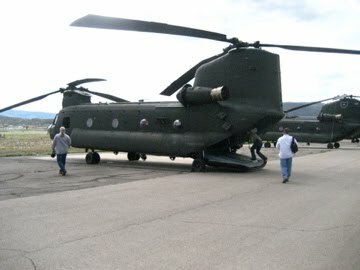 The chinook is a troop transport copter. This is what it looked like, toward the pilots. And this is what it looked like out the back. 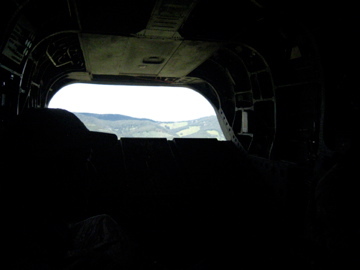 Again, unpressurized, open windows, 12,000 feet. 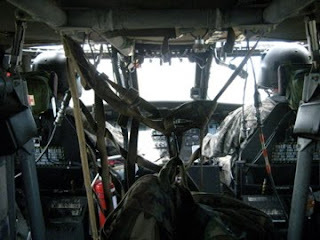 The back of the copter is a ramp. It doesn't close all the way! First, our military people are good folks. They go through a lot. They deserve respectful treatment, even if, especially if, our elected leaders (of either party) make poor decisions. Second, HAATS instruction is significant. It turns out that navigating helicopters in the mountains (whether in the Rockies, or in Afghanistan) is a tricky business. The Guard flies a lot of rescue missions in state; their expertise saves lives. Third, Colorado is just extravagantly beautiful. I can recommend seeing it up close and personal from an open helicopter. 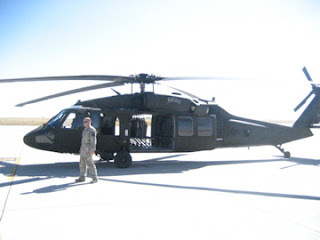 Fourth, I am deeply grateful not only to Dean, my staff person who served his country so well, but for the professionalism of the Colorado Army National Guard. Fifth, our veterans need some help in this economy, particularly, in finding jobs when they get back. I need to find something our library can do about that.